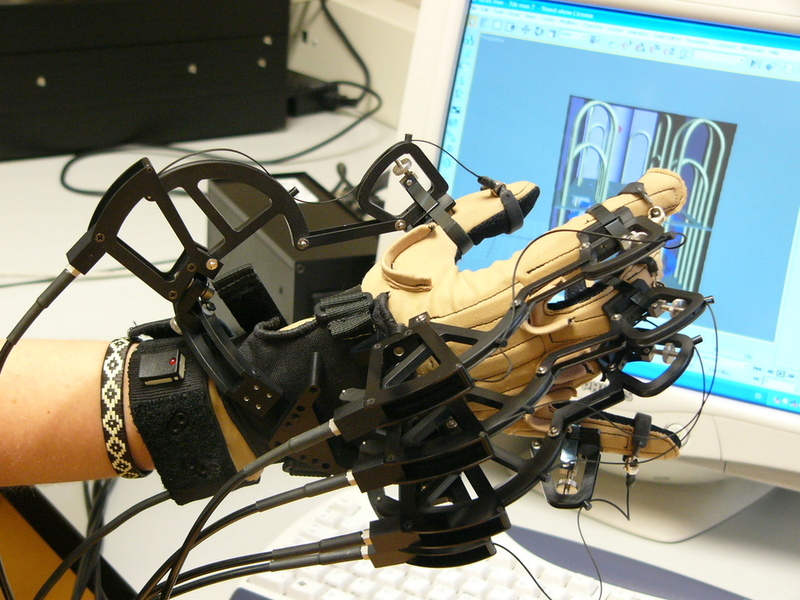 The CyberGrasp device is a lightweight, force-reflecting exoskeleton that fits over a CyberGlove data glove (wired version) and adds resistive force feedback to each finger. With the CyberGrasp force feedback system, users are able to feel the size and shape of computer-generated 3D objects in a simulated virtual world. Grasp forces are produced by a network of tendons routed to the fingertips via the exoskeleton. There are five actuators, one for each finger, which can be individually programmed to prevent the user's fingers from penetrating or crushing a virtual solid object. The high-bandwidth actuators are located in a small actuator module, which can be placed on the desktop. Additionally, since the CyberGrasp system does not provide grounded forces, the actuator module can also be worn in a GraspPack backpack for portable operation, dramatically increasing the effective workspace. The device exerts grasp forces that are roughly perpendicular to the fingertips throughout the range of motion, and forces can be specified individually. The CyberGrasp system allows full range-of-motion of the hand and does not obstruct the wearer's movements. The device is fully adjustable and designed to fit a wide variety of hands. Please Contact Us for information on applications.